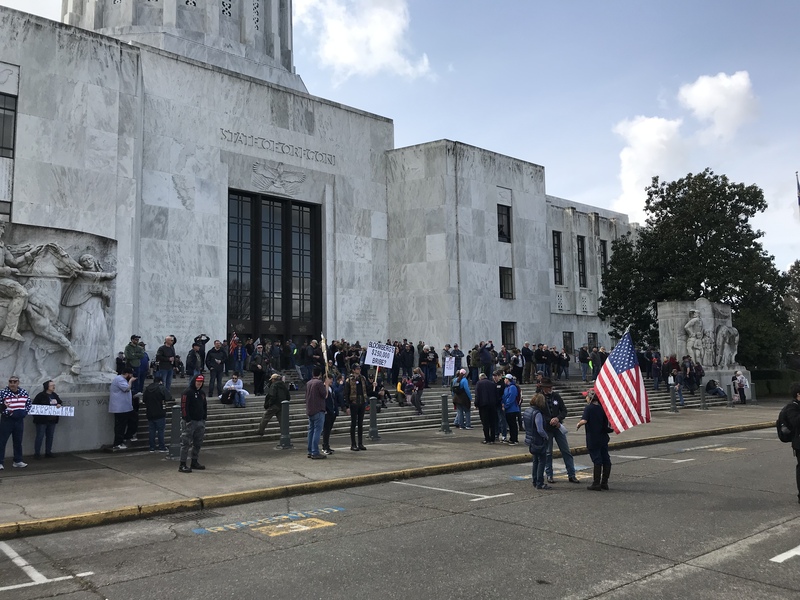 At the Oregon state capitol - Right now. 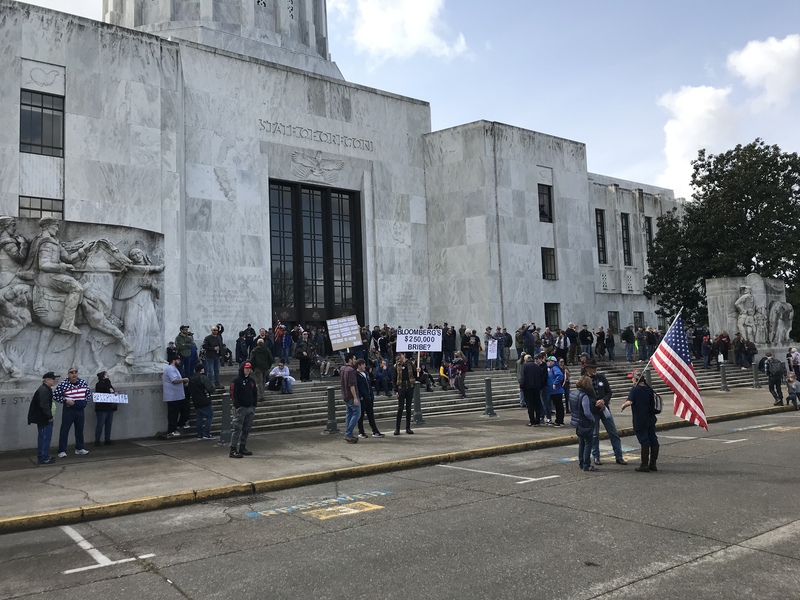 Thread: At the Oregon state capitol - Right now. I'm hopeful that the pendulum has swung about as far to the left as it is going to. President Trump's election and popularity is the leading indicator. More and more thinking people are turning away from the drivel promoted by the MSM every day. The agenda they are pushing isn't as popular with our youth as they try to make us think. Remember, these are the same people who were trying to convince us all that Hitlery would win by a landslide right up to and including the day of the 2016 election. Confiscating 300 million guns owned by over 100 million people isn't something that is going to happen overnight. Those in power recognize that we aren't going to line up to surrender them. Even in Australia only a small fraction of the privately held firearms were surrendered when the government decided to make it the law. While President Trump is a key figure, but he isn't our messiah. Someone will step up to take up his mantle when he completes his second term. All is not lost. I believe that we are nearing a tipping point where people are going to revolt against all these machinations and maneuvers by the left. It may come to armed insurrection, but I don't think freedom will be stamped out in this country in my lifetime. I pray that we can correct the course without resorting to armed conflict. It would take at least another couple of generations moving steadily left for them to gain total control. I think things will swing back to the right again before that happens. But like Daryl, I am glad I won't be here to see it if it doesn't. Last edited by BC38; 03-24-2019 at 03:10 PM. Salem is the legal capitol. Don't be so open minded your brains fall out. Why is it that about every Statehouse looks like a prison complex? Last edited by LimaCharlie; 03-24-2019 at 12:08 PM. Second Amendment: The difference between politicians and rulers. It's interesting to see this pattern repeated over and over again on so many different levels and in so many places. A population slowly drifts into an impossible form of governance with corrupt politicians, unfair taxes, extreme governmental control over private lives and intolerance of liberty. Think: California, New York, Syria, Tunisia, or Libya. The population is unable to turn back the tide of tyranny that they have contributed to creating and slowly tolerated as it grew in influence and power, so - in a fit of self preservation, they say "Enough" and leave. What do they do? They travel to somewhere that is unspoiled. Oregon, Western Europe, The American South... And what do they do once they arrive? They do everything they can to recreate the complete mess they made of the place they just escaped from. There is never a thought of assimilation into a culture that works, only work to dominate those that have shown great tolerance in even letting them resettle in their new homes. If I'm not mistaken, this is the pattern of a disease called "Cancer". I guess that there are any number of different kinds of poison. accipere facile, sed sumite! - Take it easy, but take it! Just a thought -- If people would dhow this much concern about their gun rights on Election Day, maybe we would have to go to our capitals to protest. Seems we all hope for the best and don't believe it will happen, til it does! Injunbro and ShooterGranny like this. States all have State flower, State bird, State insect, 7 have State Gun! Breaking news in Arizona: State Capitol Building occupied by rats!